A growing collection of tattoo books. Educational titles include Guy Aitchison's Reinventing the Tattoo, The Art Of The Leu Family, Chris Trevino's: Gods And Warriors, Shawn Barber's: Memoir, BJ Betts: Lettering books, Big Meas': Lettering books, Tattoo World, Dana Helmuth's: Venom & Nectar, Force in the Flesh 1 & 2, Michele Wortman's: Moments of Epiphany, Innerstate and Scratch Art. By Guy Aitchison, featuring collaborative work by dozens of tattooists including: Nick Baxter, Dan Hazelton, Marco Velazquez, Aaron Cain, Mike Cole, Don McDonald, Jeff Croci, Ty McEwen, Adrian Dominic, Markus Lenhard, Leo Lavatori, Brad Bako, Chris Walkin, Evan Griffiths and many more! 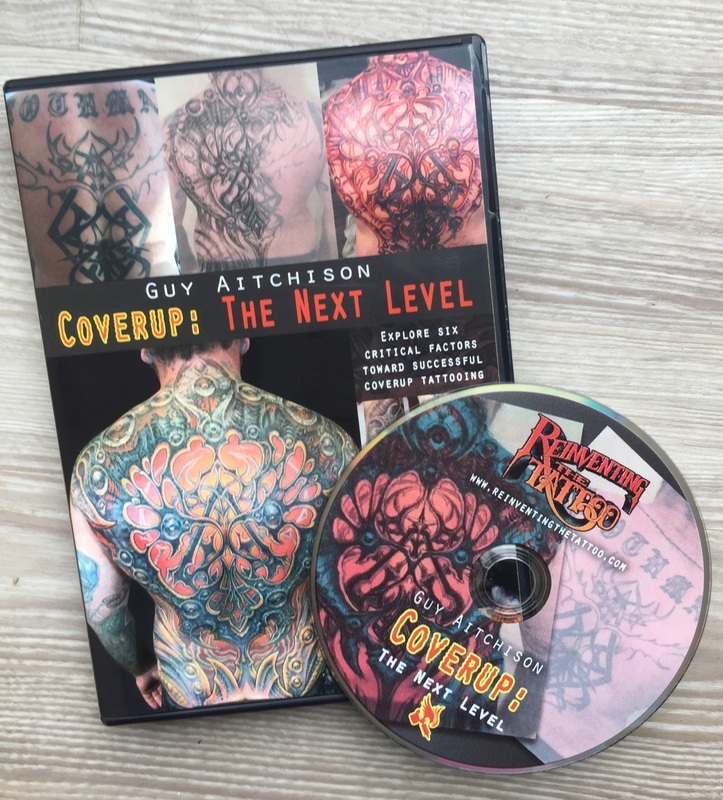 Buy your subscription to the Reinventing The Tattoo digital edition, which includes the full text of Guy Aitchison's groundbreaking book, plus extra all-new bonus content that will be updating regularly, along with access to a community of users. Video on demand items are available for streaming for six months from purchase, from one IP address at a time only. Purchasers are emailed a secure access code. Educational Tattoo DVDs for sale include Guy Aitchison's: TECHNIQUE & Coverup: A Fresh Look, Tattooing Pinups With Joe Capobianco, Michele Wortman and Guy Aitchison: Sunchannel - West Of East, Shoot it Right: by Mario Rosena, Robert McKown's: Painting a Rose, Mike DeVries': Get Real, Hell City- The Movie, Keith Ciaramello's: Keep it Real 1,2 & 3, Tony Ciavarro's: Shut Up And Draw 2, Joe Swanson's: Paint Tattoo Flash & Tattoo Style, Standards of Practice- Infection Control for the Modification Industry and the Art Fusion Experiment. Buy some tattoo books and tattoo DVDs at the same time and save some dough! Packages include Hyperspace Studios Educational Combo Pack, the Mike Devries Combo pack, sold only to professional tattoo artists. Combo packs available to the public include the Organica and Moments of Epiphany Combo.